All models have been assigned new names using a number sequence identifying the length of the vehicle and the amount of dedicated passenger seats (e.g. the 66-2 model is 6.6 metres long and capable of transporting two people). All vehicle weights remain at 3,500 kgs or under meaning they can be driven by anyone with a full UK driving licence, without needing the Class C1 entitlement. 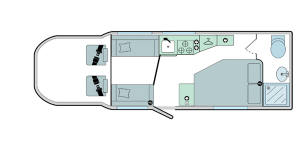 The two-berth end washroom 66-2 (formerly the 635) is carried forward, while the 70-6 (formerly 665) six-berth end lounge family layout with a drop down longitudinal double bed is also retained. New for the second generation Advance range are the extremely spacious 76-2 and 76-4 models featuring a longitudinal fixed double corner bed and a transverse end washroom with a choice of either twin parallel front seats (Advance 76-2) or an L-shaped lounge with dedicated rear travel seats (Advance 76-4). Completing the line-up are the new 74-2 and 74-4 layouts including a rear transverse double island, centre washroom and again a choice of either twin parallel front seats (Advance 74-2) or an L- shaped lounge with dedicated rear travel seats (Advance 74-4).